https://matcha-jp.com/en/4850 Experience Awa-Odori “Fool’s Dance” In Tokyo With The Tengu-Ren! 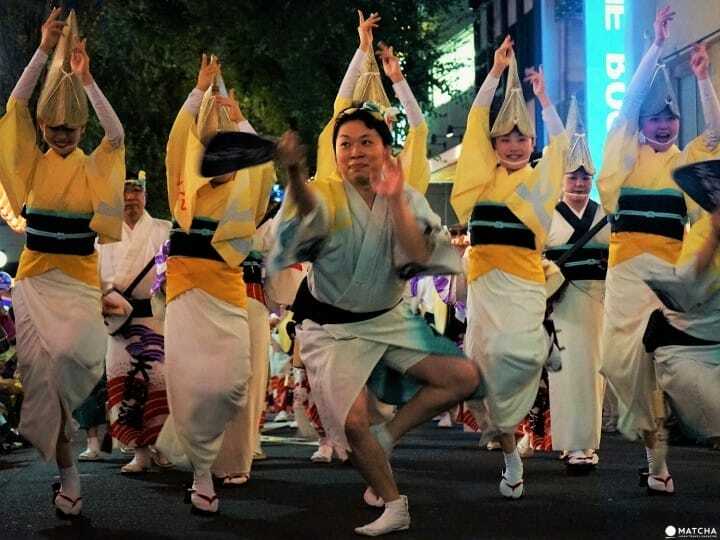 Experience Awa-Odori “Fool’s Dance” In Tokyo With The Tengu-Ren! Born in Tokushima with a 400-year-old history, the Awa Odori is a well-loved summertime festival in Japan. This is not just for its traditional value, but for its live-performance dynamism. Experience this elegant, let-loose "Fool's Dance" in Tokyo! We're The Same Fools, So Why Don't We Dance? The Awa Odori, a folk-dance and festival originating in Tokushima and dating back over 400 years, is a well-loved summer highlight in Japan. Sometimes affectionately referred to as the “Fool’s Dance,” this festival sees thousands of colorful, high-energy, and playful dancers march down the street and call out for onlookers to join in. "Odoru aho ni miru aho," the dancers sing, "onaji aho nara odoranya son son!" (It's a fool who dances and a fool who watches; if both are fools, you might as well dance!) This song is repeated endlessly during the festival, inspiring everyone to have a good time. The Awa Odori is held at Obon time, in early to mid-August. Its largest and most famous celebration is still held where it originated, in Tokushima. But don’t worry if you can’t make it to Tokushima! You can see the Awa Odori right here in Tokyo’s Koenji and Nakameguro areas! In this article, we’ll introduce you to the Tengu-Ren, one of the most well-recognized and history-rich Awa Odori dance troupes in Tokyo, as well as how you can see them live at the upcoming Koenji Awa Odori Festival. Awa Odori - Tokushima's Exciting Summer Festival! Awa Odori Festival In Kawasaki - Dance Your Way Through This Summer! This last weekend, I had the pleasure of meeting one talented troupe, the Tengu-Ren (ren meaning “group”) and accompanying them during their performance in Kagurazaka, Tokyo. The Awa Odori could be described as a relatively simple dance, made up of two forms, otoko-odori (performed low to the ground, mostly by men) and onna-odori (performed upward toward the sky, exclusively by women), performed together to the accompaniment of musicians on the shamisen, flute, drums, and bells. Even saying so, there is an unscripted element to the festival which gives the Awa Odori its flair. Much like the Rio Carnival in Brazil, Awa Odori is best experienced live to really get the blood pumping. Part of the fun of the festival is observing the unique style of each ren, or troupe. These ren distinguish themselves by uniform color and complex variations of the Awa Odori dance steps. For ease of recognition, at least one dancer will usually carry a large paper lantern with the ren’s name. While some ren are more casual, others have long histories and deep traditions. The Tengu-Ren is one of the latter. They've recently celebrated their 50th anniversary! The Tengu-Ren numbers over 130 members. To make sure they’re ready, they practice together about six times a month during the season of the Awa Odori festivals. Something unique to the Tengu-Ren is that men and women, young and old, all dance the Awa Odori together. They have an incredible age range, from 4 years to 90, and are like one big family! While their young members carry red Tengu (a type of legendary creature found in Japanese folk religion, and the symbol of their troupe) fans in hand, the Tengu-Ren is most recognizable by the distinct lemon yellow outfits of their female dancers. In Kagurazaka, it was easy to see why Tengu-Ren not only participates in various local festivals all over the country, but also perform overseas. Recently, they have debuted in countries such as Australia, Singapore, and Taiwan, growing their international recognition. Undeniably skilled, this ren also seemed to have a lot of fun. Their dance down the street was often highlighted by a break in the middle where dancers gathered for an up-tempo charge and a fast-paced music session. Viewing it head on was an amazing experience that really swept me in. Among the festivals they usually take part in, the Koenji Awa-Odori Festival is the largest! This year’s festival, which is not to be missed, will be held on August 26-27 on the streets of Koenji! Be sure to look for Tengu-Ren - they’ve been taking part in this festival for over 30 years! In 1957, the Koenji area of Tokyo planned a festival to revitalize the shopping street that ran throughout the town. It is said that this dancing festival, which debuted as the “Koenji Fool’s Dance,” was intended to only be similar to the Awa Odori. In what could be described as a twist of fate, a Tokushima born-and-raised resident of Koenji ended up providing instructions to the festival dancers, and thus, the Koenji Awa-Odori Festival was born. With such auspicious beginnings, it would be a shame to miss out on the upcoming festival. A dance born over 400 years ago, its live-performance dynamism will not fail to lift your spirits and get your feet taping. So, come out and enjoy this treasured tradition of Japan, and be sure to keep your eyes open for the Tengu-Ren. Because if we’re both fools, we all might as well dance. Enjoy Japanese Summer Festivals From June To August! Outdoor Activities In Hita - Enjoy Japan's Nature To The Fullest!